Closed on Saturdays, Sundays, public holidays and the festive season at the end/beginning of each year. Please take note that the library may be closed on days other than those mentioned above. Opening hours may also be shortened during the school holidays. For further details, please refer to the calendar on the left. For details on the usage of the department's library, please click on user's guide. The department library was initially set up as a branch of the library located at Building 8. However, due to the inauguration of the Komaba library, most of the books have been transferred from the department library to the Komaba library. Today, the function of the department library is to store and provide the basic resources and course materials for students enrolled in the Graduate School of Arts and Sciences, and the senior division of the College of Arts and Sciences. The library is usually open from 10:45 am to 5:15 pm on weekdays during the semester. Besides serving as a venue for self-study, the library also provides a host of academic journals that are relevant to the social sciences. 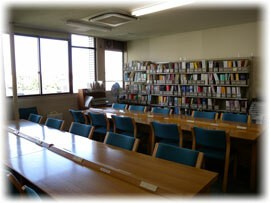 These include journals published in Japanese and English (Social science journals which are not available at the department library can be found at the 2nd Floor of the Komaba library). The department library also stores the entire collection of Master, Doctoral, and Honor theses submitted by students of the department in the past. These resources can be accessed and read at the library (Please note, however, that there are some administrative procedures involved in the viewing of submitted papers). Some of the professors at the department have also chosen to place their course materials at the library. Please follow the necessary procedures at the library counter for gaining access to books stored in the archive at the 4th Floor of Building 2 (this includes some of the books stored in thefaculty's research rooms ); as well as backdated volumes of academic journals. Books listed by the library code: “教養・社” under the OPAC system are stored in the offices of the department faculty (These books will be relocated to the Komaba library in the near future, upon the Komaba library’s expansion). These books may be loaned upon request at the counter of the department library. On a rare occasion, the loan request may take a while, as the faulty may override requests for books being used in their ongoing research. On average the requested items will become available at the library counter within a week. Please click here for more details. Copyright © 2011 Department of Advanced International and Social Studies, University of Tokyo. All Rights Reserved.